Some continue to question whether the periphery Erurozone governments really tapped large amounts of ECB funds via their banking system. One doesn't have to look far for evidence of this "backdoor" funding. The chart below (ht Kostas Kalevras) shows how much the Eurozone central governments have deposited with the ECB (via their national central banks). 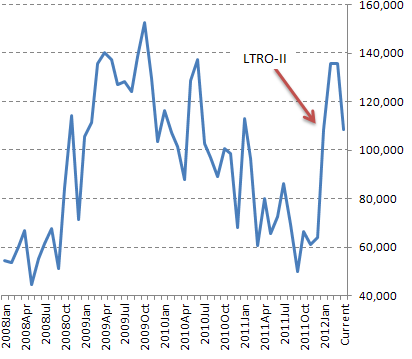 The big spike was right after the LTRO II. These governments are now draining their cash reserves quite rapidly. Depending on market conditions later in the year, the ECB may need to do another round of long-term funding to allow the governments to replenish their reserves. The banks in some of the nations have simply become nothing more than conduits between the ECB and the governments. It's difficult to see how this process could be sustainable over the long term.